Streusel and Molasses Shoofly Pie, another whole grain dessert. I made this for our Thanksgiving dinner, I waited to share the recipe because there was a flood of sweets being offered and I wanted this pie to have a little spotlight of its own. I love vintage recipes and this one is delicious. Shoo Fly Pie has been referred to as syrupy, and you just might find a bit of molasses on your plate when you are done enjoying your slice of pie. I am a molasses fan. So much so that previously I have shared a Shoofly Cake, recipe that is quite delicious and wonderful for weekend breakfasts, plain or with fruit on the side. Be warned, however, this recipe is from the early days when I did not have a camera and no real experience as a blogger. I believe I went back and updated the post when I did get a camera. But the recipe itself is perfect and like I stated, delicious! When I was thumbing through the More with Less Cookbook and came across this recipe for Shoofly Pie, I knew it had to make it's way to our table. 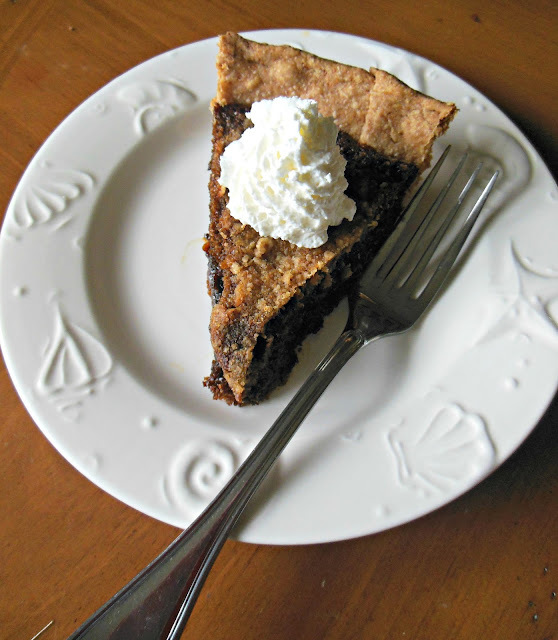 The Shoofly Cake has a bit of cinnamon in the crumb mixture, molasses and cinnamon are naturals together, so feel free to add some cinnamon to the pie recipe also. If you enjoy molasses, you will love this pie, I did and will make again. There is something about this pie that calls out to me. It might be the flavor, but it could just as easily be the fact that this is an old recipe dating back hundreds of years...I seem to like those recipes a lot. Shoo Fly Pie with Whipped Cream, delicious! Combine flour, brown sugar, and butter, cut together with a pastry blender or by using your hands to create crumbs. Reserve 1/2 c crumbs, set aside. Combine in a mixing bowl, molasses through hot water, add crumbs and beat together. Pour into pastry shell, top with reserved crumbs. Bake 35 - 40 minutes or until done in your oven. You may serve this delicious pie plain, or with whipped cream or ice cream. This pie is waiting for some whipped cream! Humm, I'm curious about this version, but I often find shoofly pie to be too sweet for me. I'll have to think about whether I'll make it. I hope you try this one, it is not on the "too sweet" side. Sometimes I think it has to do with the molasses, some are sweeter than others. This pie is a good keeper and the flavor is delicious right to the end. I've heard of shoefly pie, but didn't know what it was nor have tried it. Looks yummy! Thanks for sharing on the Waste Less Wednesday Blog Hop! The Pennsylvania Dutch love their sweets, maybe they add more sugar. Thanks for stopping by. 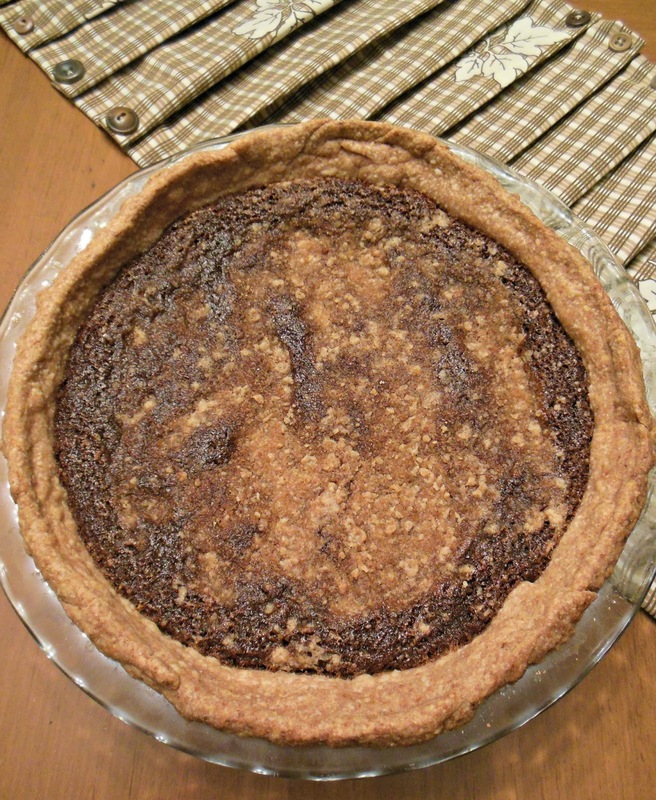 Oh my goodness, my Grandmother used to make Shoofly Pie, this sure brings back some awesome memories! Hope you have a fantastic week and thanks so much for sharing with us at Full Plate Thursday. Mmmmm molaaaaaasses...I've never heard of shoofly pie and it can be as sweet as it wants to be in my opinion ;) Thanks for sharing with us at Funtastic Friday!